My kingdom for a Havarti! Havarti is a Danish cheese, by the way. I was recently flipping through a book of quotations and wondered how famous sayings or book titles would change if cheese was incorporated in them, in an appropriate way. Here is a sampling. If you like Physics or Mathematics (or both), then you will find “The Mathematical Mechanic” by Mark Levi fascinating. Can be proved using the fact that still water in a container is stable. by stable incompressible fluid flow in a plane with fluid sources of strength 1/k^2 at position +k, -k and sink of strength pi^2/3. If the title distrubs you then you definitely need to read this book. The ideas in this book made a deep impression on me. Although written in an informal style, the message is clear, entertaining, and … scary – but in a good way. Let’s start with the cover page – notice the difference from the original Michelangelo? Adam puts his finger in the barrel of the gun that God is pointing at him, like in a Bugs Bunny cartoon – indicating that we can survive even if God wants us dead. God is only one of the many higher powers that affect people’s lives. It could be an institution, government, community, family, as well as church. People grant greater authority to higher powers than they would to any individual human being. Unfortunately, when we surrender our thoughts to the alleged greater wisdom of a higher power, it may blind us to our own self-interest. The higher powers rule us by planting ideas in our heads (Memetics – see the book by Dr. Susan Blackmore ). Memes are ideas, like viruses, that survive by reproducing in other hosts. The higher powers have also evolved tricks and tactics to keep the individual under control and fully or partially enslaved. 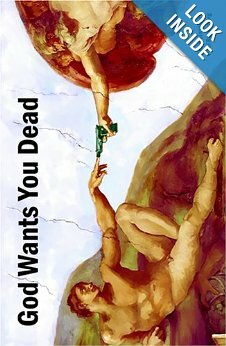 Read God Wants You Dead to find out in how much deep water you, an individual, are, even in modern “civilized” society. But all is not lost. The second part of the book is about how to gain back your freedom from parasitic memes that occupy your brain, and to protect yourself from future infections. This is a book worth perusing several times. A fascinating book with an underlying theme of how evolution drives certain patterns that appear counter-intuitive at first glance; this book will make you rethink things you always knew to be true, and some you wished you had known before. Bloodletting may be a cure: germs thrive on iron, and decreasing iron in the body helps fight the infection. Fava beans damage red blood cells in people with a specific gene variant. This gene variant is common in several populations, but these same people cultivate Fava beans in the first place. The link? protection against malaria. Epigenetics: It’s Nature and Nurture, apparently. to the extent that a pregnant woman on junk food can cause her grand-daughter to have higher risk of obesity and diabetes! Nutrition levels in the mother even at time of conception have a marked effect on the development of the baby. A lot of our DNA actually comes from ancient (and recent) viruses. The good news is, at least some of this DNA is useful to humans. Thanks to Dr. Prasad Agashe for lending me a copy of this book! Patrick Lencioni is perhaps better known for his best-selling book, The 5 dysfunctions of a team. However, I could relate better to The Three Signs of a Miserable Job by the same author, because the insights in this book can be made use by people in both direct contributor and manager roles. When asked, “Do you love your current job?”, if there is no spontaneous and immediate “Absolutely” in response, then you should read this book! If you are a manger, and even if a few persons in your team doesn’t love their jobs then you simply must buy several copies – one for yourself and the rest to give to the management hierarchy above you! 1. Anonymity. People need to be understood and appreciated for their unique qualities by someone in a position of authority. People who see themselves as invisible or just a ‘resource’ cannot love their jobs. 2. Irrelevance. Everyone needs to know that what they do in the job matters to some people. These people may be within the organization or without. 3. Immeasurement. Employees need to be able to gauge their progress and level of contribution for themselves. They cannot be fulfilled if their success depends on the opinions or whims of another person, no matter how benevolent that person may be. Of course, compensation and a good work environment are important too. But really, all these are what are called ‘hygine factors’. Employees decide to leave an organization when they feel anonymous, irrelevant, or not in control of their success. Conversely, they will stick around even at lower pay and difficult work conditions provided they are recognized, feel that their work matters to someone, and have measurable criteria for performance. The book teaches these principles forcefully by telling a story of a man who first realizes these principles and then applies them to turn two organizations around. The last chapter summarizes the principles, the costs of not paying attention to them, and how to go about applying them in your own organization.